Former Bollywood actress, Twinkle Khanna, has disarmed the Indian audience with her charming wit and sense of humour. When she’s not busy writing her bestseller, India’s beloved writer Twinkle also produces movies and works as an interior decorator. Twinkle writes a column for The Times of India and Daily News and Analysis (DNA), and her witty and funny observations as well as her boldly liberal opinions have captured the interest and respect of her readers. Her first book, "Mrs. Funnybones", was an extension of her blog/column of the same name was published in 2015 and sold over one million copies making her the highest-selling female author of the year. Her second book, "The Legend of Lakshmi Prasad", was published in 2016. It is a fiction book containing four short stories with a deep look at how society’s small-mindedness can have such a profound influence on individual lives. She won the Crossword Book Award 2016 for "Mrs. Funnybones". She won India Today Woman Writer of the year 2017, for Her second book, The Legend Of Lakshmi Prasad, published by Juggernaut Books, which has been at No. 2 on Amazon since its release, and has received rave reviews: "Twinkle Khanna's first collection of short fiction features sensitive, humorous and eminently readable stories" , says The Hindustan Times. 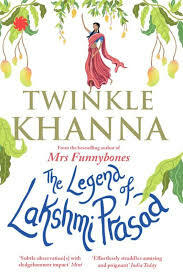 "The Legend of Lakshmi Prasad, a collection of superbly crafted short stories by Twinkle Khanna, is as delightful as its author. Witty, elegantly crafted, with odd protagonists who don't understand the meaning of defeat, it is a triumph of the human spirit." (Daily O). "Sprinkled with fine wit and represent great cultural commentary." (The Hindu). Twinkle Khanna is a popular columnist at Daily News and Analysis after hours and The Times of India. Penguin Random House have announced that Twinkle Khanna's book Mrs Funnybones hit the Nielsen bestseller list at number 2 in its first week of sales.